HJ - DJH Collecting Box Banderole (Banderole für Spendenbüchse). 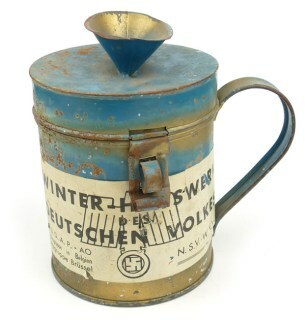 As used on the collecting boxes used at the street collections (Reichsstraßensammlung) held by the 'Deutsches Jugendherbergswerk'. Decorative original item! 'Winterhilfswerke' (WHW) "Hitler's Dank - Für den Dienst am Volke" Badge, issued in the Gau Süd-Hannover Braunschweig. The coin shaped badge is having a diameter of 35mm, it has a pin-back device to its reverse. Nice original badge in good condition! WHW (Winterhilfswerke) 'Mit Brüdern in Not teile dein Brot' commemorative stoneware plate (Wandteller). This commemorative ceramic plate is showing an eagle and is marked with 'Kreis Duisburg 1937-38'. The plate measures approximately 27cms in diameter. Rare and decorative original piece! W.H.W. 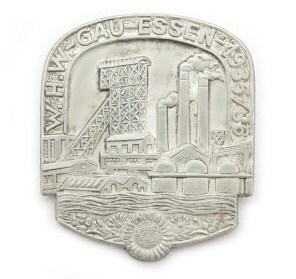 'Meine Erste Tat' - 'Gau-Hamburg' 1936/37 Tinnie (Veranstaltungsabzeichen). The tinnie is nicely maker marked by the company of 'Carl Wild' from Hamburg. The tinnie is complete with a functional pin/catch construction. Nice and decorative example in good condition! Winterhilfswerke 'Polizei Tag' Donation Pin 1942 (Veranstaltungsabzeichen). Nice original donation pin, zinc example complete with its functional pin constuction. Nice and decorative original tinnie! Small lot of WHW Tinnies from the series 'Geschosse und Munition', this street collection was held on 2/3 November 1940. 7 tinnies, 1 tinnie is regrettably missing it's pin. Nice original tinnies in good condition! Small lot of 'Winterhilfswerke' (WHW) Porcelain Figures from various series/street collections. The lot is including 16 porcelain figures, birds and butterflies. Decorative original porcelain figures in good used condition! Small Lot of 'Winterhilfswerke' items. 3 pieces from the series 'Ausrüstung der HJ', this street collection was held on 10/11 May 1941. Great looking original items! Set of 6 'Winterhilfswerke' (WHW) Paper Door Plaques as issued during the October 1939 to March 1940 season. These were pasted on the door to show you had donated to the WHW. The plaques are sized approximately 8 x 11 cms. Decorative original set! 'Winterhilfswerke' (WHW) "1933 W.H.W. 1934 Der Führer Dankt" Badge. The coin shaped badge is having a diameter of 40mm, it has a pin-back device to its reverse. The badge is not visible maker marked. Nice original badge in good condition! Original full box of WHW Tinnies. 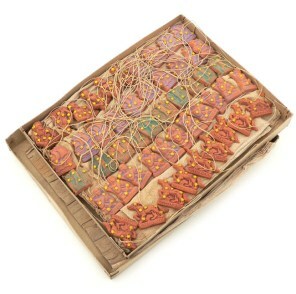 The original carton box is containing 100 pieces in total. This are pieces from the series 'Sternbilder', from October 1944, these pieces have never been issued and were found in their original cartons in the factory. Decorative original box of WHW tinnies!